Thanks, Steve! I am a huge admirer of your work, so you comment means a lot. Thanks Dave! Back at ya! Anyway, don't give up on the build and keep posting. I wanna see what you do with this fantastic piece! Dude! I feel your pain! So what are you gonna use as the stripping agent/method? I actually seem to have more success with enamel than with acrylics, but, to each their own. What, specifically, caused the "bust"? Did you paint another type of paint for the primer? Do you know what went wrong? Already stripped down to the primer and pre-shading just using Testors enamel thinner, some paper towels, q-tips, and a lot of elbow grease. Cleaning up fine details now, doing some clean up sanding, then I'm going to let it dry and paint either tonight or tomorrow. 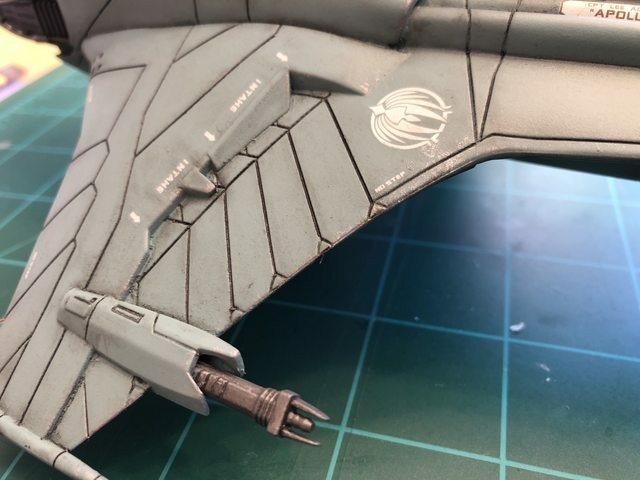 I am very new to airbrushing so I'm not sure what went wrong. 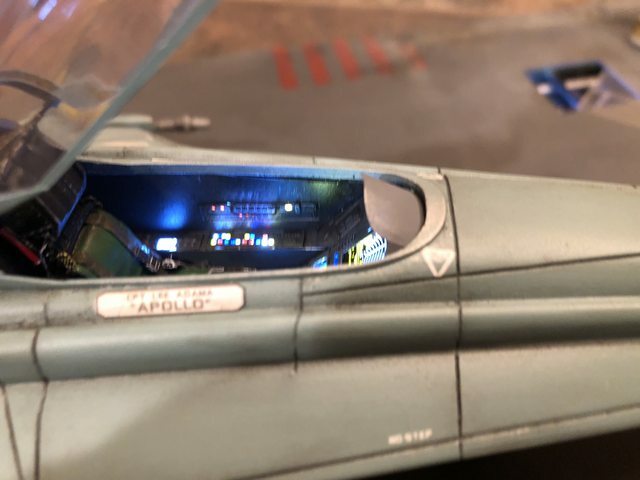 I was using Model Masters Pontiac Engine Blue which is a nice metallic blue-gray but I either had it too thin and it ran, too thick and it didn't cover right and clogged the brush, so that the final result was just not what I wanted. 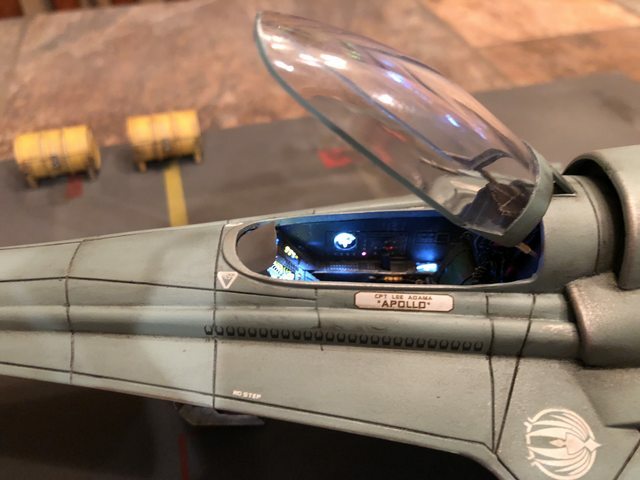 It's a great color and I have a rattle can of it as well I am going to try on some spare plastic to see if I can get what I want, but most likely I will use some kind of acrylic gray-blue mix. It was surprisingly easy to strip down. 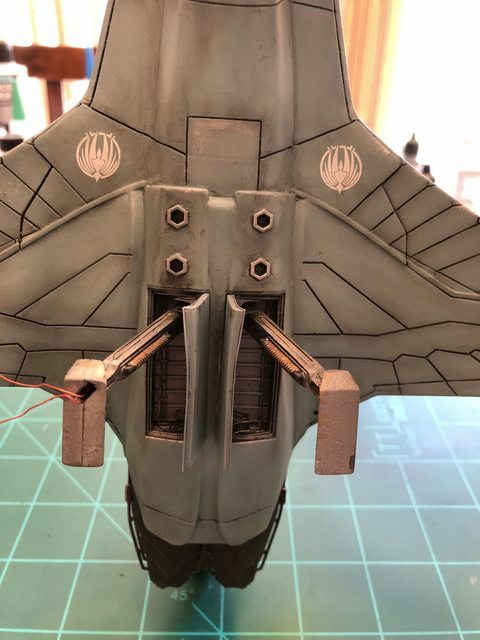 Hey Modeler Dave, I thought I would chime in on your airbrushing and enamel woes and do so especially because Steve has also! As Steve did mention, it's to each his own when it comes to the paint chemistry that one chooses to use. If you "grew up" on enamels then they're probably your "go to" paints for getting back into the hobby. 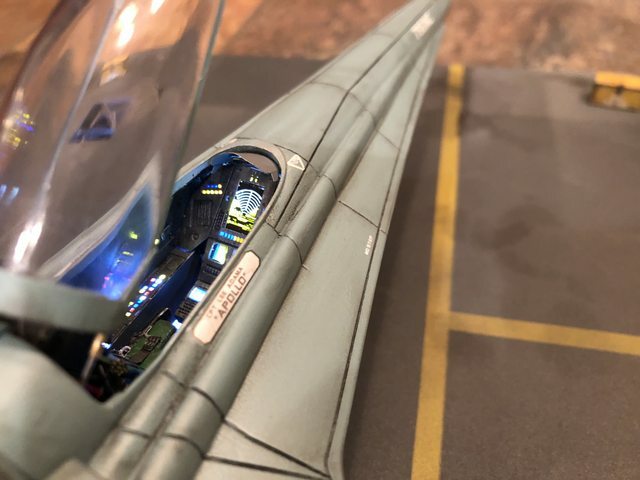 But I have to tell you, there are some wonderful acrylics that are durable, finely pigmented, and can be airbrushed directly with no thinning. It takes all the guess work out of thinning ratios and the mess out of airbrush cleaning that we used to have. 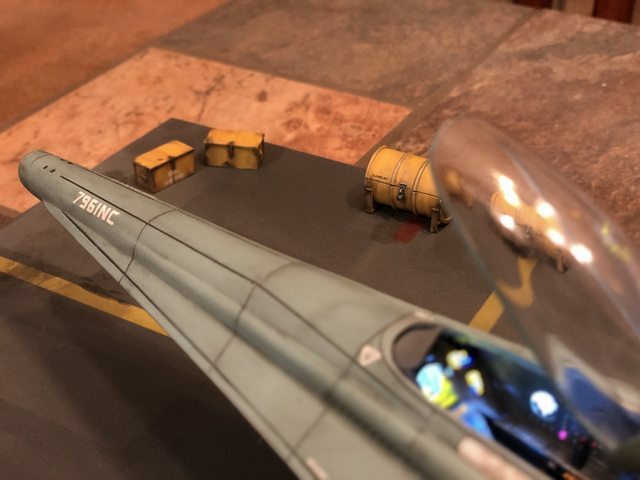 In fact, I just finished a vintage Cylon Raider (pics forthcoming) in Ammo by Mig acrylics and I couldn't be any more pleased. 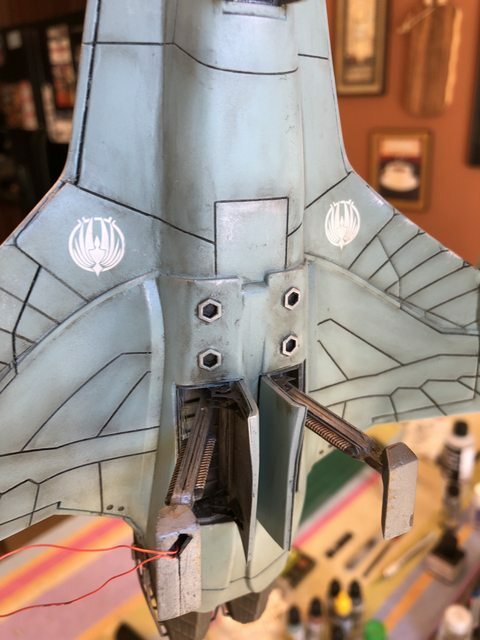 I've also been airbrushing with Vallejo Air acrylics for WWII armor and found the same high level of performance and finish with even more paint color availability. 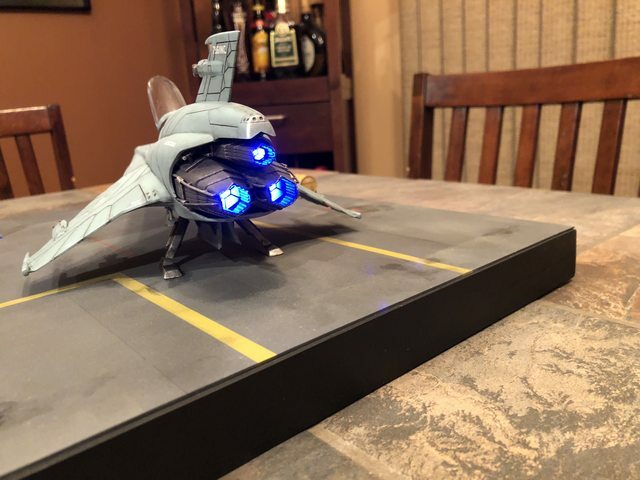 I've built the Viper Mk I and Mk II and used Tamiya flat white as the base color and was quite pleased with the results, but with my Cylon Raider, I used a combination of Ammo by Mig Cold Gray and the darker Stone Gray paints. 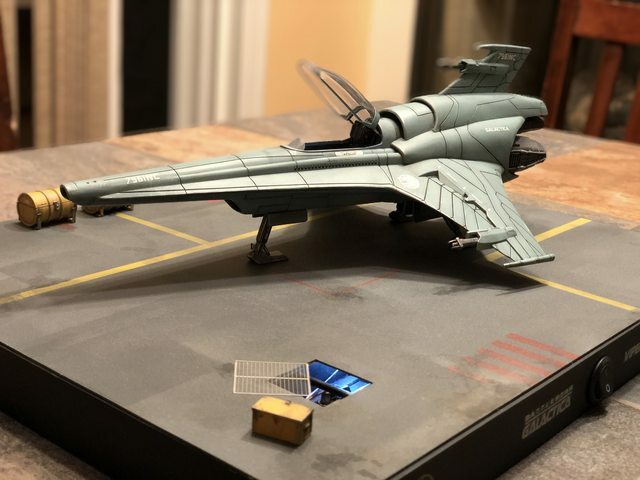 Since the MK VII always appeared somewhat darker to me, you might look into the Stone Gray color, as well as other potential Vallejo colors. When it comes to enamels, as modelers we really don't need the durability they provide and acrylics will suffice in this regard. Since acrylics are water soluble, they afford brush painting and diluting to make washes very easy. Anyway, that's it for my input. I'll let Steve and other join the conversation. For me it's interesting how i choose my paints these days. For the recent "ECTO-1" I decided on enamel spray cans, though I am pretty sure I could have obtained a good white/gloss cote finish with the airbrush. For everything else these days I am using Stynylrez primer and acrylics with the airbrush. The acrylic are all over the map between Testors AB paints, Vallejo paints thinned and other mixes thinned as needed. For the most part, not going back from the airbrush. I'll let Steve and other join the conversation. Thanks, Al. 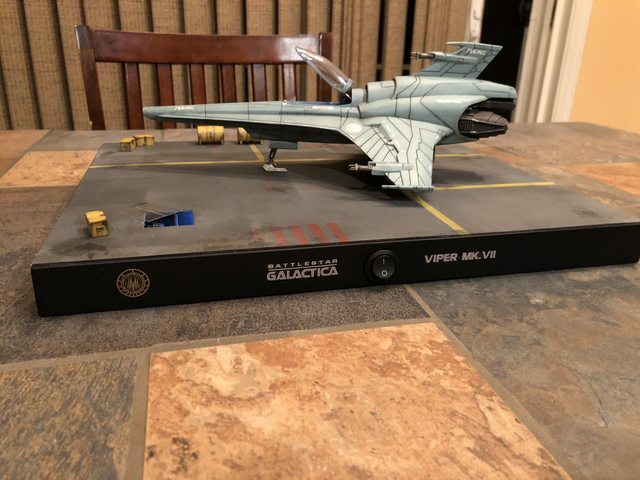 It was a very specific color recommended for the Viper body and I just could not get it to work. I also had a rattle can of the stuff and it went on a little better but was way too granular for my taste, so I ended up repriming everything and repainting using an acrylic. 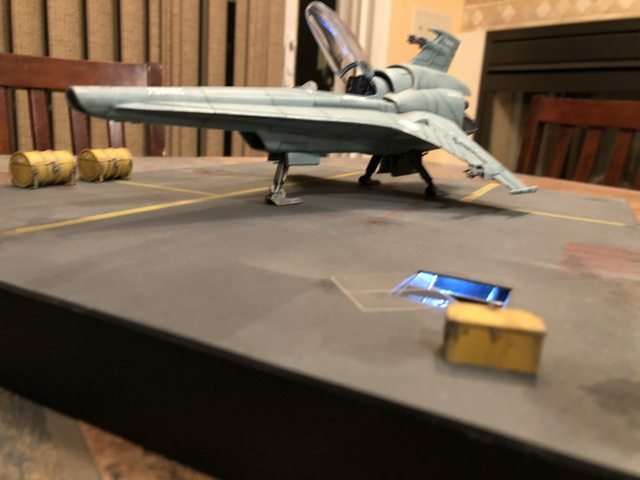 Good news is that the model is basically done! 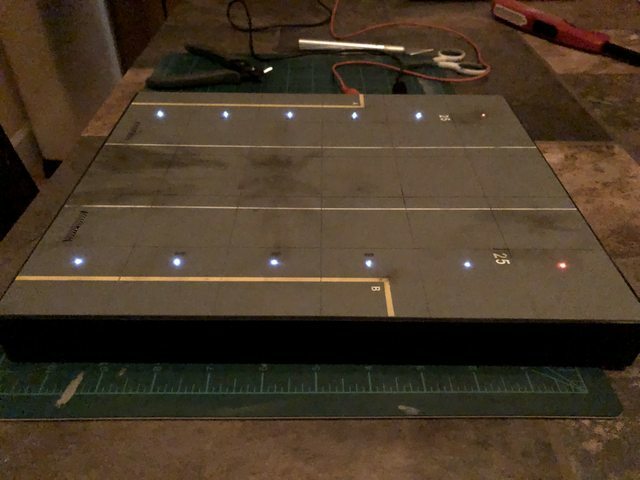 I need to finish wiring up the base and then I will be posting pictures of the end of the build and the final product. Steve, just do what you always do -- add some great insightful comments and suggestions! Dave, sounds like you've turned the corner on this one. Best of luck getting it finished and in the "Gallery". I kept the weathering fairly minimal. It's easy to go overboard and I didn't want to make this one too banged up. Lots of pics. Sorry about the quality, i only have my iPhone to use and the indoor lighting is horrible. I'll take a few more tomorrow in the daylight. I'm also going to write a full post-mortem about what I learned from this build, but not until tomorrow. I need a drink! First try with an automotive paint from a rattle can. I disliked the outcome and primed over it to start fresh. 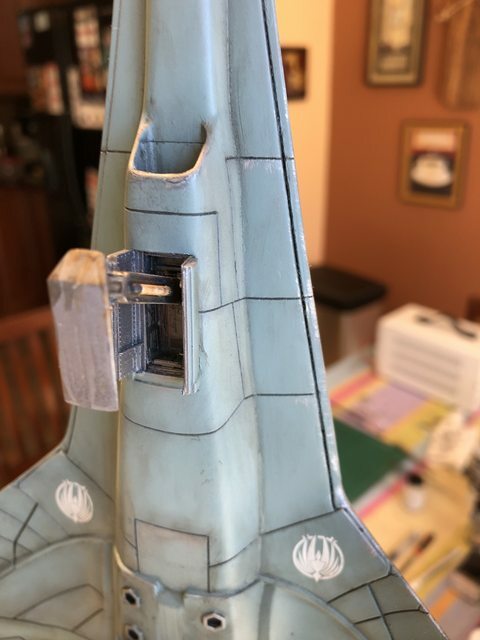 So much putty along the body seams to get the stupid cockpit to fit. Thank god for weathering to cover up the larger mistakes. 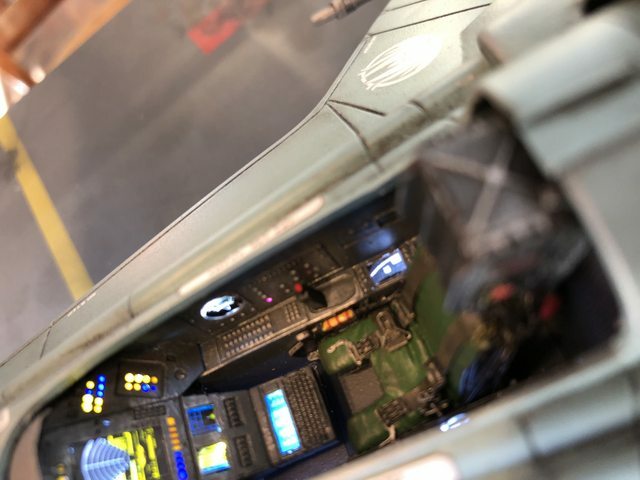 You won't see much of the underside once it's mounted. 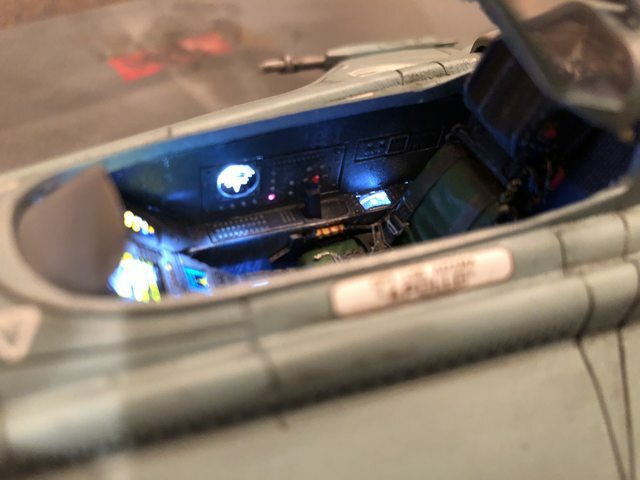 I added a scratch-built throttle since the kit only has one mounted in the pilot's hand, and I'm not using the pilot. Now for the post mortem. I have a love/hate relationship with the airbrush. I love the results (mostly), but the constant clogging, working on proper paint thickness (too thick! too thin! ), cleaning it all the time, sometimes uneven spraying...ugh. I'm chalking most of this up to my inexperience, and I am getting a little better, but it's still a bit of a dreaded chore. 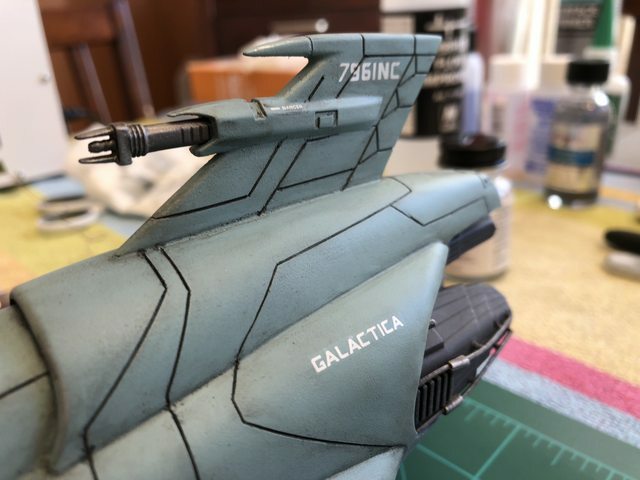 I am not ready yet to try to actually weather with an airbrush until I have a lot more practice. I am terrible at soldering! It really shouldn't be this hard. It still looks great - despite all the "firsts". I understand your relationship with the airbrush! I have the same one with mine. Still, it looks better with it than with hand painted brush marks. What's next on the bench? Thanks, Steve! Despite all the issues (aren't they a requirement for this hobby?) I'm pretty happy with how this came out. 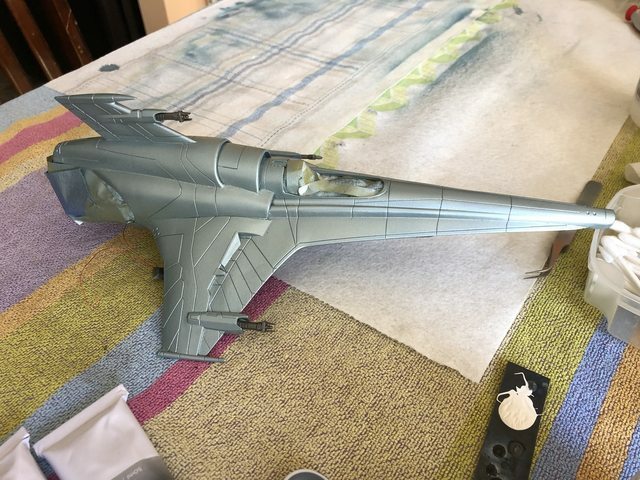 I am working on a Moebius Colonial One but I may work on a rather lousy Revell F-14C model I picked up on sale just to practice my airbrush skills on something I'm not going to be overly particular about. And not have to worry about custom lighting! Here's the base I build for Colonial One. The white lights are constant; the red lights are synced to blink on and off together. Wow.. That interior of that thing is incredible. Great job. Thank you! I appreciate the comment.